We live in a time of great polarization. Politically, in nations across the world, both the left and the far right grow more numerous, and draw further away from the mainstream establishment, every year. Economically, the rich continue to separate themselves from the poor, as the very rich do from the rich. And in tech, of course, we increasingly live in a “winner-take-most” world. on the part of Facebook people actually see — the News Feed, not Trending News — conservatives see conservative stories, and liberals see liberal ones […] liking opinions that tell us we’re right instead of engaging with viewpoints that make us question our assumptions. 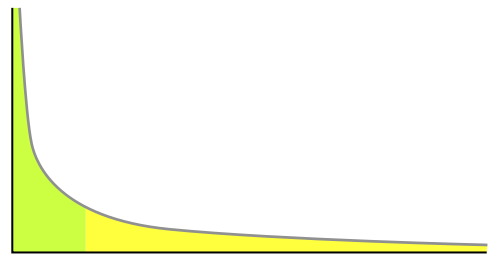 …And, of course, all online news follows a power law as well. Polarization is even reshaping — and amplifying — the fringes of political belief, by boosting conspiracy theories, according to Fast Company. Facebook claims polarization isn’t their fault, and that’s basically true; it’s an emergent property of human nature, accidentally midwifed, not the outcome of anyone’s conscious malevolent decision. One can’t help but wonder if this unexpected political redistribution is one reason why both the pundits and the pollsters have been so wrong of late. Look at FiveThirtyEight.com, the heroes of 2012. Of late they look like soothsayers reading entrails. I’m not just talking about the rise of Trump; last year their predictions of the UK’s general election were terribly wrong. This is all driven, at least in part, by technology. The winner-take-most world of software — if your software is better, it quickly eats the world faster than others, without being limited by geography, distribution limitations, or other hardware constraints — accelerates economic polarization. Facebook’s filter bubbles accelerate political polarization. As for political polarization — yes, it fragments communities and pits neighbors against one another, but it still seems a whole lot better than a media controlled by a narrow, blinkered establishment whose fundamental goal is to perpetuate itself and its self-serving views. A polarized world is also one in which previously unthinkable viewpoints can be seriously proposed, vigorously argued, and accepted by the majority with astonishing speed. (Remember when legal marijuana and gay marriage seemed like distant, unachievable goals?) It’s a world prone to more conflict, but also more and faster change; high-risk, high-reward. That’s a tradeoff that I for one am tentatively, optimistically, willing to accept.